Apple’s HomePod: a problem for Sonos and Amazon, or a niche for fans? Photo by nobihaya on Flickr from WWDC 2017. Let’s take Google as an example. Google knew that I was going to Moscow (itinerary emailed to my Gmail address). Google knew my schedule (Calendar). Google should know my various interests by now, from reading my Gmail messages and Docs content. Due to me being of such an advanced age that I still use email rather than text, Google definitely knows my real social network (the people with whom I correspond via email). I think this is what Google is trying to do – but people don’t trust companies yet with this stuff, do they? So it sorta was, or maybe not? The reason: Google search results are based on an algorithm that scans the internet for free content. After the Journal’s free articles went behind a paywall, Google’s bot only saw the first few paragraphs and started ranking them lower, limiting the Journal’s viewership. Executives at the Journal, owned by Rupert Murdoch’s News Corp., argue that Google’s policy is unfairly punishing them for trying to attract more digital subscribers. They want Google to treat their articles equally in search rankings, despite being behind a paywall. The Journal’s experience could have implications across the news industry, where publishers are relying more on convincing readers to pay for their articles because tech giants like Google and Facebook are vacuuming up the lion’s share of online advertising. Apple has jumped into the growing battle for the camera in Silicon Valley, with a new “augmented reality” app platform for developers that will face off against Facebook, Snapchat and Google. The new “ARkit” capabilities being introduced in the next version of iOS will give Apple “overnight the largest AR platform in the world”, Craig Federighi, its software chief, told app makers at its annual Worldwide Developers Conference on Monday. Demonstrations displayed at the event in San Jose showed an improved version of Pokémon Go, one of the biggest apps of last year. The ARkit toolset allows the game’s monsters to bounce around streets and parks in a more realistic fashion. Apple framed its bid to bring digital images to the iPhone camera window’s view of the real world as a leap forward in user-interface design alongside the iPhone’s 10-year-old “multitouch” screen. Coming in iOS 11, of course; the fact it’s a kit means it can be part of apps everywhere. And this will make iOS the world’s biggest AR platform within about a month of iOS 11’s release. 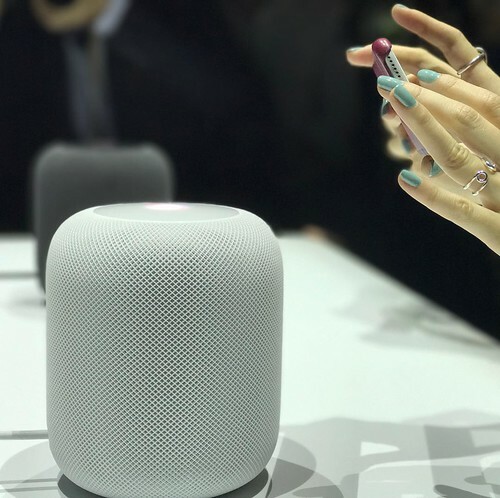 The HomePod’s small, vase-like case houses a four-inch woofer and seven tweeters. It’s powered by Apple’s A8 processor, just like the iPhone. HomePod features “real-time acoustic modeling,” which allows it to tweak music to suit its environment. Apple is also targeting Sonos as a competitor, which is a sign that the HomePod’s audio quality will be better than what we’ve seen from Amazon and Google. HomePod is coming in December for $349, which is significantly more than the Amazon Echo, Google Home and Sonos’s $300 Play:3. It’ll be available in white and Apple’s usual space grey. December?! I guess it gives Sonos plenty of time to get its advertising in line. It’s got its own page on Apple’s site. Despite worldwide PC demand having declined for five consecutive years, Samsung Electronics, Huawei and Xiaomi have returned to the notebook market because of milder competition compared to the smartphone market. However, sources from the upstream supply chain pointed out that Xiaomi and Huawei, which were originally expected to achieve good shipments, did not perform as well as expected because demand remains weak for consumer notebooks. For its first year, Xiaomi shipped less than 500,000 units and Huawei 700,000 units. At the same time, Asustek Computer has also not performed well and has begun a business reorganization, looking to regain its momentum. Asustek is expected to start seeing shipment growth in the second half of 2017. Sources from the upstream supply chain noted that Xiaomi and Huawei originally hoped to quickly expand into the notebook market with their strong brand recognition, advantages in shipments, and familiarity to the China market, but have not achieved the results they wanted so far. Xiaomi had apparently been targeting 2m units; it got a quarter of that. May be running out of ideas. A browser-hijacker called Fireball has ignited concern, having already infected more than 250 million computers worldwide, and 20% of corporate networks globally. According to Check Point, it takes over target web browsers, turning them into zombies. However, Fireball also can be turned into a fully functioning malware downloader, and is capable of executing any code on the victim machines. That means it can carry out a wide range of actions, including stealing credentials and loading ransomware. For now, it seems focused on adware. Fireball manipulates victims’ browsers and turns their default search engines and home pages into fake search engines, which simply redirect the queries to either yahoo.com or Google.com to generate ad revenue. According to Alexa’s web traffic data, 14 of these fake search engines are among the top 10,000 websites, with some of them occasionally reaching the top 1,000. Fireball also installs plug-ins and additional configurations to boost its advertisement activity. Amazon plans to have another go at selling its own branded smartphones. The ecommerce giant, which killed off its Fire Phone in 2015, is working on a new lineup of smartphones branded as “Ice”, according to two sources familiar with the matter. Unlike the Fire Phone — for which Amazon focused largely on the US and a couple of other western markets — the company is eyeing emerging markets like India for selling its new phones, said the sources. Amazon’s upcoming smartphones run the latest version of Google’s Android operating system with Google Mobile Services (GMS) such as Gmail and Google Play, the people said. Incorporating Google Mobile Services in its devices is a major change in strategy for Amazon, which currently offers a range of Android tablets without Google apps on them. The smartphones are being referred to as ‘Ice’ internally, in what could be a move to distance itself from the disastrous Fire Phone brand, though it’s not clear if Amazon will eventually bring the devices under the Ice name. Amazon declined to comment. If true, bad idea. It’s money down the drain. Hyperlane works a lot like existing dedicated commuter lanes, only instead of paying extra to use higher-speed, lower-congestion lanes in a human-driven vehicle, the separate lanes are only for autonomous vehicles. After entering an acceleration lane, Hyperlane’s central computer takes over the car’s functions and finds a slot for it in the already fast-moving traffic in the dedicated lanes. Barrs and Chen said vehicles would travel at speeds up to 120mph, and that the centralized computer control – which would be in constant communication with each vehicle using emerging 5G technology – would allow for a more tightly-packed traffic pattern. “We liken the Hyperlane network to an air traffic control system,” Barrs said. Sensors in the road would evaluate traffic density, weather hazards, accidents and other changes, prompting the system to adjust vehicle speed as necessary. Like Uber’s pricing structure, fees for Hyperlane would be based upon demand. Hmm. Controlled by a central computer. No chance of that going wrong, and no risk with vehicles going at 120mph. One of the challenges of parenting is that you have to spend a lot of what was once your own time caring for your kids. This time must be taken from an existing activity. After all, there is a fixed number of minutes during the day. Where do parents usually draw from? In the same spirit of looking at time use for working adults over all of adulthood, I counted the hours for people with one child under 18 in the house and compared the totals against those without a child in the house. 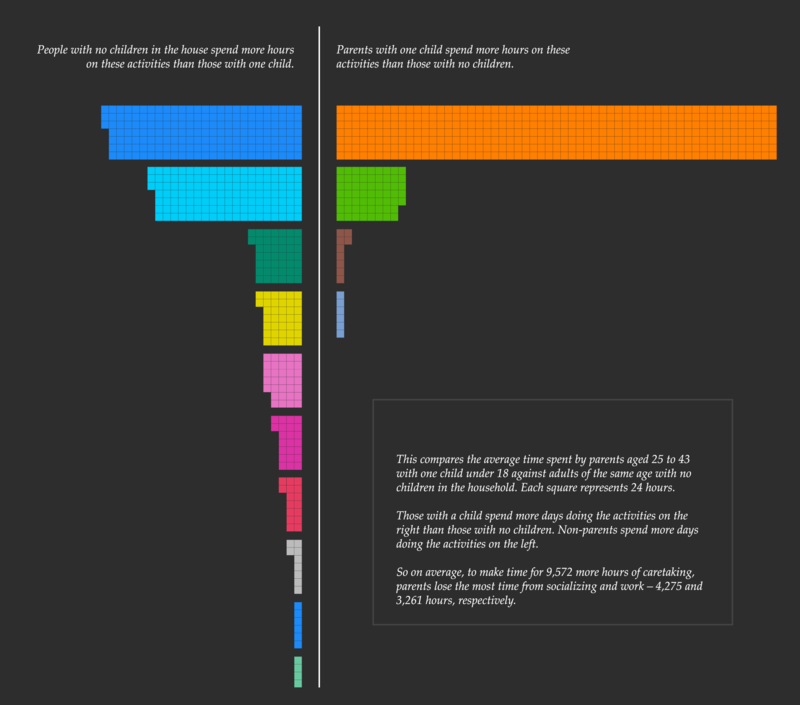 For simplicity’s sake, I focused on employed people from age 25 to 43 (25 is the average age Americans have their first kid), and the comparison below shows differences for the same time span. Between the age 18 to 43, a parent with one child spends 9,572 more hours caretaking than someone without a child in the house and 1,468 more hours on household work. These hours are pulled mostly from socializing, relaxing, and work. Tell me about it. Great visualisation too. This is evident in the European Union’s intensified scrutiny of how Silicon Valley tech platforms operate. Germany’s antitrust agency is investigating Facebook. The EU conducted an antitrust probe into Amazon’s e-books business deals (the company agreed to change its contract with publishers in May). Days before the Oxford conference, the EU fined Facebook $122m for making misleading privacy statements to the EU when it acquired WhatsApp for $19bn in 2014 about the ability to match Facebook and WhatsApp accounts. (The merger of the popular texting apps raised concerns that Facebook’s online advertising business could gain an unfair advantage.) Days before that, watchdogs in the Netherlands and France slapped Facebook on the wrist for privacy violations. There’s a growing feeling that current US antitrust law isn’t able to cope with the emerging problems created by the big companies, particularly Facebook and Google. The benefits of having self-driving cars go far beyond automatic parking or fewer accidents, Intel CEO Brian Krzanich told CNBC on Thursday. Among those other benefits: Driverless cars will double as security cameras, he said from the sidelines of the Code Conference in California. “I always say that the cars are going to be out there looking, so the next time an Amber alert comes up and they’re looking for a license plate, the cars should be able to find that license plate quite rapidly,” said Krzanich. “We’ll have to put limitations on it,” he said. “We’ll have to encrypt that data and make sure I can’t tell that it’s John’s [car] necessarily,” said Krzanich. Mass surveillance without a warrant! How delightful. The worldwide wearables market maintained its upward trajectory during the first quarter of 2017 (1Q17) with Xiaomi and Apple leading all companies and multiple products experiencing double- and triple-digit growth. According to the International Data Corporation (IDC) Worldwide Quarterly Wearable Device Tracker, companies shipped a total of 24.7m wearable devices during 1Q17, up 17.9% from the 20.9m units shipped in 1Q16. “Fitbit finds itself in the midst of a transformation as user tastes evolve from fitness bands to watches and other products,” noted Ramon Llamas, research manager for IDC’s Wearables team. “This allowed Xiaomi to throttle up on its inexpensive devices within the China market and for Apple to leverage its position as the leading smartwatch provider worldwide. Now that Xiaomi and Apple have supplanted Fitbit, the next question is whether they will be able to maintain their position. Puts Apple and Xiaomi level at 3.6m, though Xiaomi’s are bargain-basement bracelet-style trackers, a form factor which I think has already peaked. The top five players (Xiaomi, Apple, Fitbit, Samsung, Garmin) have just over half the market, and none is Android Wear. I suspect the latter is barely growing its user base now.